Becca Williamson will break up any couple at her high school for the simple price of $100 via Paypal. She is sick of all the couples in her high school making single girls feel inadequate just because they aren’t in a relationship, so she is more than happy to manipulate a seemingly happy couple into a break up. But then Becca receives her toughest request yet–someone wants her to break up the school’s power couple, Steve and Huxley. This was a really great story about relationships and the effect they can have on friendships. Most of the people who request help from the “Break-Up Artist” are people who feel as though they’ve lost their best friends since he/she began dating someone. Many people in high school are guilty of this–dropping everything for their first boyfriend/girlfriend, including abandoning their friends. Becca, as the Break-Up Artist, feels she is doing a good deed by splitting these couples up so people can have their friends back, and when her own best friend commits the crime of practically abandoning Becca for her new boyfriend, Becca feels even more justified in what she’s doing. Becca herself has never had a boyfriend and is vehemently opposed to the seemingly universal high school belief that one needs a significant other to matter. Her best friend Val, however, will do just about anything to get a boyfriend, even if it means outright lying about herself to snag one. After witnessing her sister get jilted on her wedding day, Becca doesn’t believe in real love, and thinks that people like her parents just settle for someone to marry. She has no problem breaking up all of these couples, because she thinks she is actually doing them a favor. When she is given the task of breaking up Steve and Huxley however, everything begins to change. She was Huxley’s best friend before Huxley began dating Steve and got popular, leaving Becca behind to wonder why she was no longer good enough to be Huxley’s friend. Becca works to insert herself back into Huxley’s life so that she can find the weaknesses of Huxley and Steve’s relationship and figure out how to exploit them. However, she begins to realize that maybe some couples are in fact meant to be and it isn’t her place to decide whether or not this is the case. At the same time that she begins struggling with the morality behind her job, someone at school begins trying to find out who the Break-Up Artist is, so they can stop her from ruining any more relationships. 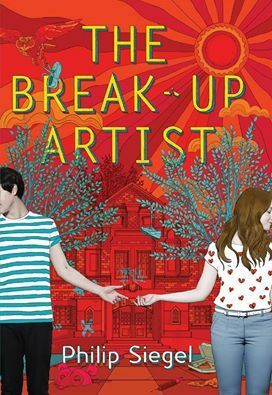 Overall, The Break-Up Artist was a great story about how relationships in high school can affect friendships and more. I definitely recommend this one! The Break-Up Artist will be released on April 29, 2014. This sounds really interesting, will definitely check it out 🙂 Also love the cover 🙂 Thanks for the great review!